A Palestinian scholar of the fourth amoraic generation (fourth century), often quoted in conjunction with R. Aḥa (Lev. R. vi. 5; Cant. R. to v. 16), R. Judan (Gen. R. xlvii. ; Cant. R. to i. 4), and R. Judah b. Simon (Gen. R. xv. ; Cant. R. to i. 2). Although his name appears in connection with some Halakot (Yer. Shab. vii. 9b; Yer. Pes. i. 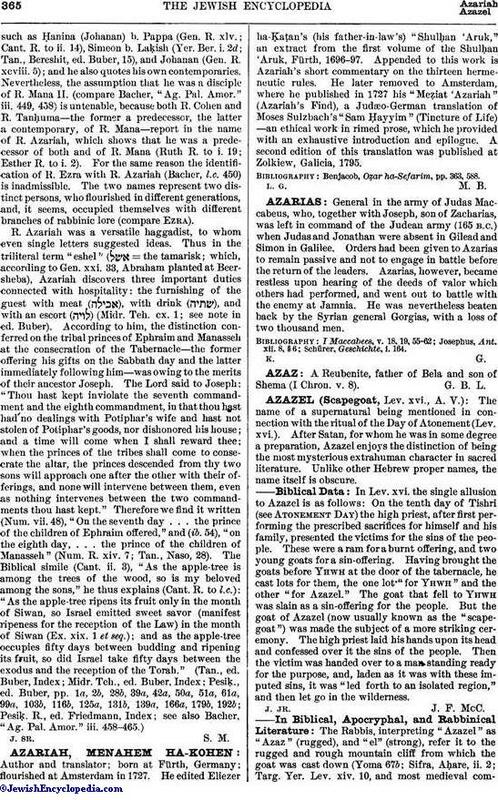 28a), it is doubtful whether he ever became interested in legal topics; and the halakic questions with which his name is associated probably belong to R. Ezra (compare Frankel, "Mebo," p. 120b). Nor can the names of his teachers be definitely ascertained. 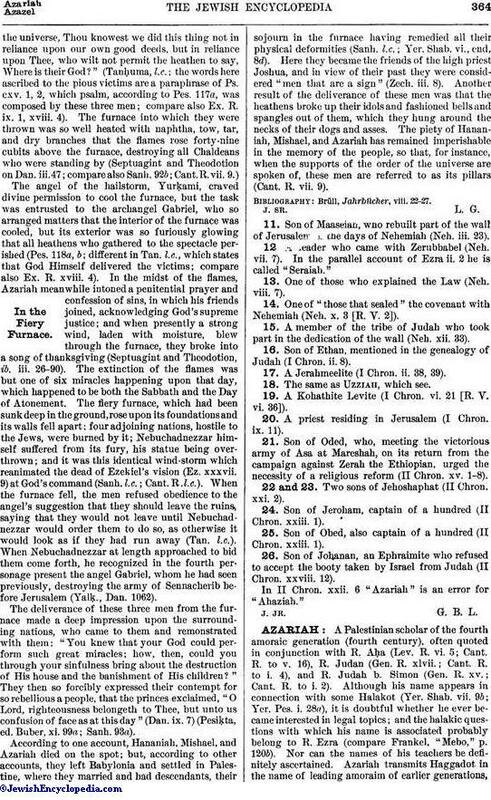 Azariah transmits Haggadot in the name of leading amoraim of earlier generations,such as Ḥanina (Johanan) b. Pappa (Gen. R. xlv. ; Cant. R. to ii. 14), Simeon b. Laḳish (Yer. Ber. i. 2d; Tan., Bereshit, ed. Buber, 15), and Johanan (Gen. R. xcviii. 5); and he also quotes his own contemporaries. Nevertheless, the assumption that he was a disciple of R. Mana II. (compare Bacher, "Ag. Pal. Amor." iii. 449, 458) is untenable, because both R. Cohen and R. Tanḥuma—the former a predecessor, the latter a contemporary, of R. Mana—report in the name of R. Azariah, which shows that he was a predecessor of both and of R. Mana (Ruth R. to i. 19; Esther R. to i. 2). For the same reason the identification of R. Ezra with R. Azariah (Bacher, l.c. 450) is inadmissible. The two names represent two distinct persons, who flourished in different generations, and, it seems, occupied themselves with different branches of rabbinic lore (compare Ezra).